This edited collection is an erudite and empirically rich volume that recasts Allied war crimes trials in Asia, and reconsiders questions of global justice and empire, decolonization, and Cold War history. War crimes trials in the 1940s marked the ambivalent “demise of an old political-legal international order defined by European hegemony and the advent of a new putatively anti-imperial one” (p. 3). By reconstructing the geopolitical landscape of Asia in the aftermath of World War II, von Lingen and her coauthors reimagine war crimes trials as a foundational space for the transition from a world of militarized empires to post-imperial nation-states. Drawing on multilingual and multi-archival sources in Chinese, English, French, Dutch, and Russian this volume underlines anew war crimes trials as global and quintessentially “imperial” undertakings. From the rue Catinat in Saigon to the courtroom of Khabarovsk on the Soviet-Chinese border, war crimes trials rested on global networks characterized by “massive exchange of criminal intelligence, of suspects or witnesses, and even of court personnel (judges and prosecutors) among the different jurisdictions” (p. 119). Imperial hierarchies, sovereignty, and race cut across the pages of trial records, affidavits and archives. Milinda Banerjee (chapter 4) examines the conservative trajectory of decolonization and self-determination, focusing on the persistence of Eurocentric approaches to spatial and territorial sovereignty. Drawing on the dissenting opinion of the Indian jurist Radhabinod Pal at the Tokyo Trials, Banerjee sheds light on Pal’s critique of the moral universalism of global justice, and the failure of anticolonial elites to transcend racialized political and economic hierarchies, or reckon with new forms of structural exploitation after empire. Anja Bihler (chapter 5) elucidates how wartime Chinese jurists and diplomatists such as V. K. Wellington Koo (Gu Weijun) and Wang Chonghui used adherence to international legal codes, treaties, and procedural standards as a lever for ending legal extraterritoriality after 1943. Wolfgang Form (chapter 7) shows there was in fact little to distinguish how international law was deployed in southeast Asia by the putatively anti-imperialist United States and European empires. Despite formal independence of the Philippines in 1946, the United States reserved the right for its judges to intervene in the trials, forcing jurists in Manila to adopt an attitude of deference to the juridical forms of the American colonialism to enhance the international legitimacy of the Philippines’ legal order. Extending the exploration of law and great powers, Neil Boister (chapter 2) explores the politics of drug enforcement in China from the Shanghai International Opium Commission in 1909 to condemnation of Japanese traffic of illicit drugs at the Tokyo Trials to shed light on the origins of American designs for the post-war legalist-sanctionist drug regime. The Japanese Empire’s military advance in Asia after 1931 shattered European power and militarized a generation of youthful nationalist leaders who pursued national liberation within the expanding Japanese imperium. The case of Burma is illustrative of the moral complexities of the European powers commitment to empire after 1945. In a volte-face, Aung San and the Burmese National Army (BNA) had turned on their erstwhile Japanese allies. Despite standing accused of personally killing a village leader aligned with the British, Aung San was never brought before the British war crimes trials. As Robert Cribb (chapter 6) demonstrates, British authorities wielded war crimes trials as an effective lever to revitalize colonial credibility. Preoccupied with the reconfiguration of Britain’s overseas empire, officials in London and Rangoon were prepared to make extensive political concessions to anticolonial nationalists to ensure British economic and strategic interests and to marginalize radical pro-Japanese leaders. Put simply, war crimes trials served imperial efforts to contain the most militant anticolonial demands for radical institutional restructuring of the nation-state. The situation was even more precarious in the Dutch East Indies where, as Lisette Schouten (chapter 9) demonstrates, war crimes trials were held amid anti-colonial insurrections led by nationalist youth groups (pemudas), intercommunal massacres, and escalating destructiveness of military reprisals by the Dutch and their Christian Ambonese auxiliaries. The Dutch attempt to save its Asian empire and restore “tranquility and order” faced formidable opposition. Dutch authorities refused to negotiate with nationalist anticolonial leaders Sukarno and Hatta who were despised as collaborators and traitors. Schouten is convincing in illustrating Dutch authorities’ use of war crimes trials to stem the national revolution, as exemplified by the prosecution of Japanese officers sympathetic to Indonesian republican forces. The themes of collaboration and imperial complicity figure prominently in this volume. Until the coup d’état in March 1945, Japan preserved the pro-Vichy colonial authorities in Hanoi, which retained enough authority to crush communist uprisings in Tonkin and Cochin China in late-1940. Beatrice Trefalt (chapter 3) picks up the story of French prosecutor Robert Oneto, whom the government in Paris dispatched to Tokyo in 1946 to preserve French Indochina and establish France’s claims on wartime reparations. Anne-Sophie Schoepfel (chapter 8) shifts attention to the military courts and streets of Saigon and Hanoi. At war’s end, French colonial administrators were confronted with challenges to their writ north and south, most seriously in Tonkin by Ho Chi Minh’s proclamation of a new democratic republic in Hanoi in August 1945. War crimes trials were wielded by French authorities to project “new republican power, capable of protecting Indochina and re-establishing its colonial authority” (p. 179). Dean Askielowicz (chapter 10) examines the complexities of imperial citizenship through Australian prosecutions of Koreans and Taiwanese who served the Imperial Japanese Army before the dismemberment of the empire. By August 1945, there were nearly 200,000 Koreans and Taiwanese each serving throughout the militarized Japanese imperium. Australia adopted a hardline stance towards convicted war criminals shaped by a domestic electorate hostile to acts of leniency. Only in the early 1950s, when economic imperatives between Canberra and Tokyo became pressing, did Australia finally release Japan’s former imperial subjects. Valentyna Polumnia (chapter 11) delves into the geopolitics of the 1949 Khabarovsk trial of twelve former Kwantung Army officers and argues convincingly that the trials resulted from dissatisfaction with Soviet influence at the Tokyo Trials. Khabarovsk was “conceived as a corrective” (p. 241) to the Allied failure to prosecute Emperor Hirohito and major Japanese war criminals. However, I am not as sanguine as the author in seeing the trials as “strong evidence of the professionalization of the Soviet justice system” (p. 259). In the final chapter, Adam Cathcart explores the historiography of the 1956 Shenyang and Taiyuan war crimes trials. He convincingly shows war crimes trials were used by the Chinese Communist Party to signal solidarity with the revolutionary ambitions of the Japanese masses and to build societal support within Japan for reestablishing Sino-Japanese diplomatic relations in the 1950s. If I am to offer a critique of Justice in a time of Turmoil, it is that it does not contend with the place of war crimes trials in global discussions of human rights in the 1940s. This volume would also have benefited from closer consideration of how Western jurisprudence multiplied imperial authority locally, entrenching rather than weakening racial, legal and political hierarchies and thus cementing sovereign inequalities in international order. But these are, ultimately, minor concerns. Kerstin von Lingen and her contributors have added tremendously to our understanding of war crimes trials as an interdisciplinary field of global history, and importantly, as a key legal conjuncture in the unraveling of European empire in Asia. Andrew Levidis: Rezension zu: Lingen, Kerstin von (Hrsg. 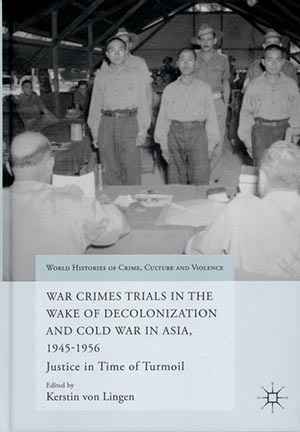 ): War Crimes Trials in the Wake of Decolonization and Cold War in Asia, 1945–1956. Justice in Time of Turmoil. London 2016 , in: H-Soz-Kult, 10.07.2018, <www.hsozkult.de/publicationreview/id/rezbuecher-27129>.